MPC’s Tamper-Evident Polyester Asset Labels literally become “VOID” if removed from the mating surface. Additionally, a “VOID” message remains on the item in place of the label. These labels consist of a 2.0 mil gloss white polyester face stock, top laminated with a 1.0 mil clear polyester film. The 0.7 mil high-performance permanent pressure-sensitive adhesive bonds to high- and low-surface energy plastics, stainless steel, glass, and nylon. 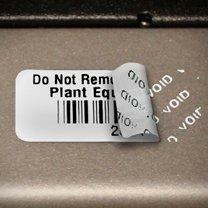 Why choose MPC’s Tamper-Evident Polyester Asset Labels? 0.7 mil high-performance permanent pressure-sensitive adhesive.